Eaton’s Molly Curry serves during the Eagles match with Twin Valley South on Monday, Sept. 17. Eaton won in straight sets, 25-11, 25-21, 25-12. 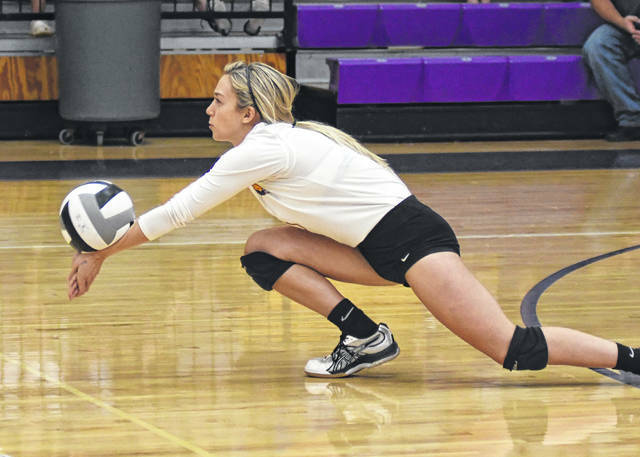 Eaton’s Makenzi Cooper goes for a kill during the Eagles win over Twin Valley South on Monday, Sept. 17. 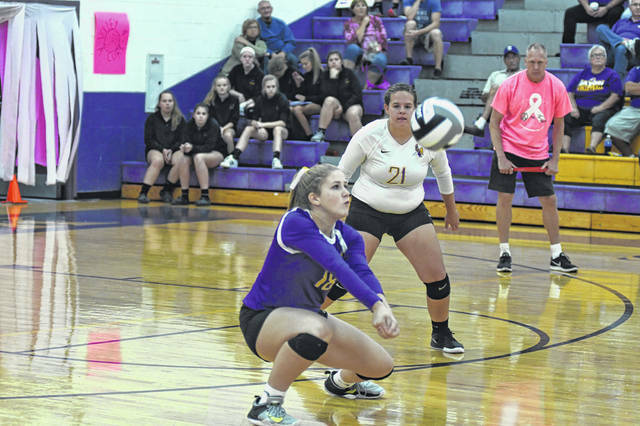 EATON —Eaton’s volleyball team improved to 10-3 overall and 5-3 in the Southwestern Buckeye League with a pair of wins last week. 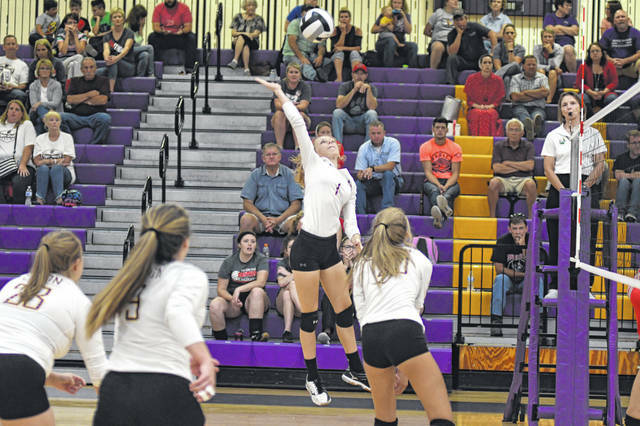 The Eagles opened the week with a straight sets win, 25-11, 25-21, 25-12, over visiting Twin Valley South on Monday, Sept. 17. Shaylen Perry led Eaton with 11 kills. Kylee Pitsinger added 10 kills, with Becca Mowen added seven. Carsyn Lammers paced the team with 20 assists and Maley Tinstman added 11. Claire Sorrell chipped in with six. Annika Gels had 12 digs and Courtney Giffen added 10. 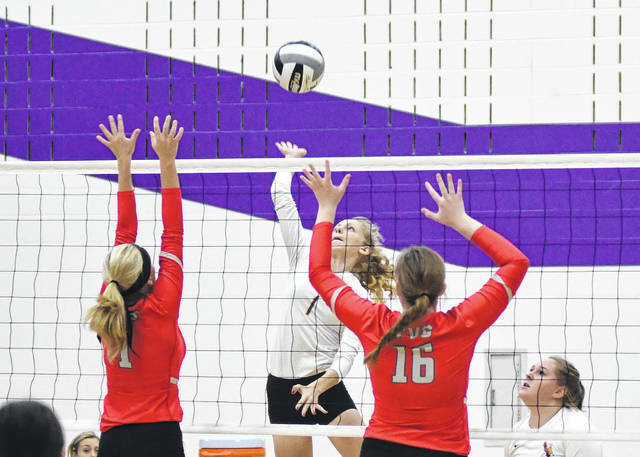 Eaton suffered its third league loss of the year when it fell at state-ranked Bellbrook 25-14, 25-20, 26-24 on Tuesday. Despite the loss, Eaton remains in second place in the SWBL Southwestern Division behind Bellbrook. “We played hard the whole match. 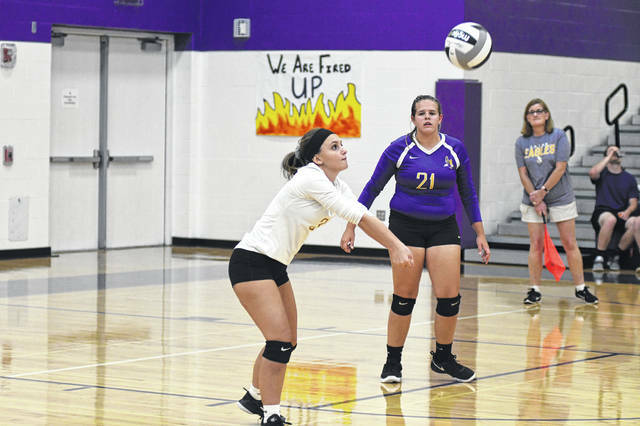 Our passing broke down at crucial moments in the match, and Bellbrook took advantage of that,” Fields said. Mowen led the team with six kills. Giffen added five and Pitsinger and Perry each chipped in with four. Tinstman led the team with 14 assists. Gels had 13 digs and Kayleigh Michael added 12. 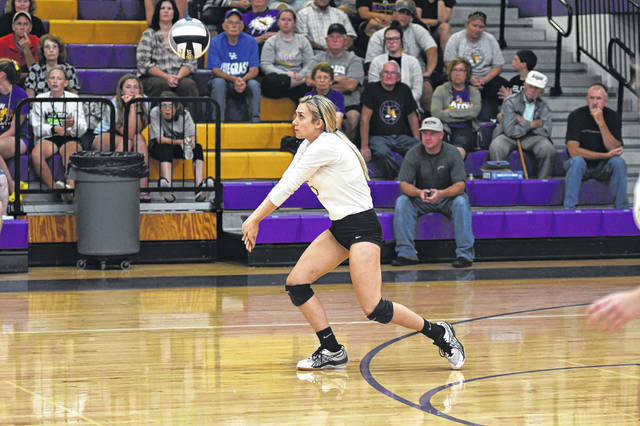 The Eagles closed out the week with a 25-11, 25-3, 25-14 win over host Franklin on Thursday. “Good opportunity to get all the kids in with some quality playing time,” Fields said. Perry led the team with nine kills five blocks. Libby Giffen added six kills. 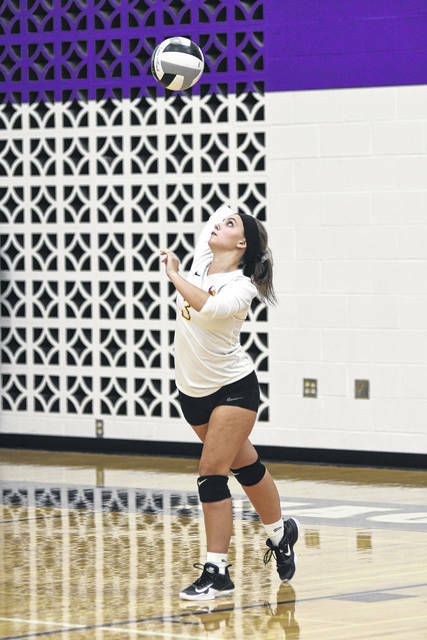 Tinstman had 12 assists and Lammers added 10 and four aces. Eaton was scheduled to travel to Kettering Fairmont on Monday, Sept. 24 and was to host Valley View on Tuesday. They will close out the week by hosting Talawanda on Saturday. 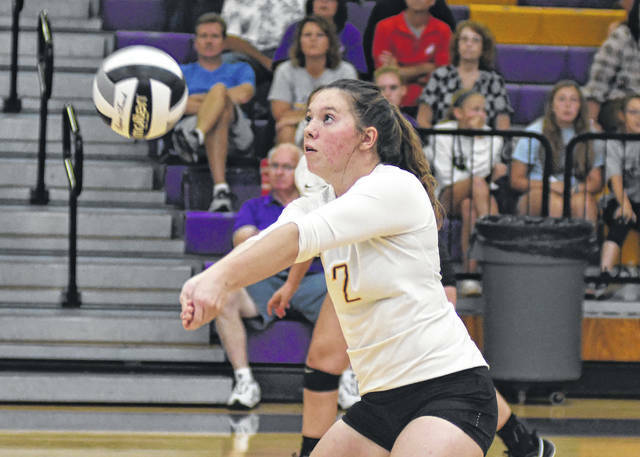 https://www.registerherald.com/wp-content/uploads/sites/41/2018/09/web1_ehsvb4-2.jpgEaton’s Molly Curry serves during the Eagles match with Twin Valley South on Monday, Sept. 17. 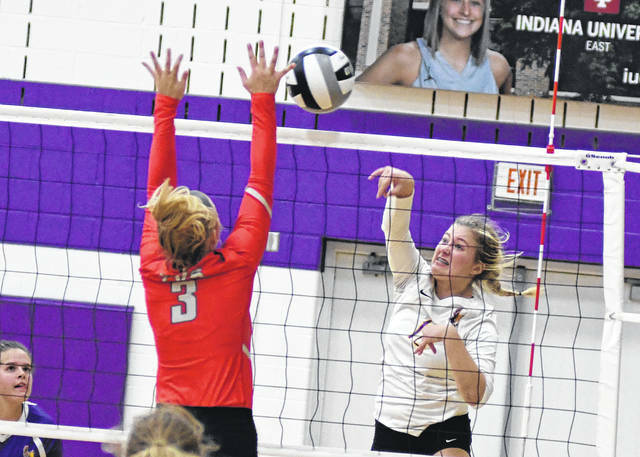 Eaton won in straight sets, 25-11, 25-21, 25-12.
https://www.registerherald.com/wp-content/uploads/sites/41/2018/09/web1_ehsvb8-2.jpgEaton’s Makenzi Cooper goes for a kill during the Eagles win over Twin Valley South on Monday, Sept. 17.